Motorcycle riders count all sorts of people with all sorts of talents. Matt from Colorado Springs does awesome illustrations and comics. Matt is 53 and have owned lots of bikes, HD’s, Triumphs, many Japanese. He also owned his own design/illustration studio for many years until he quit that and have been a carpenter for the last 10 years. Besides running the great webcomics KNJ Moto and Moto Basturds he’s into sport touring in the western US as well as dirt bike riding with his son, not to mention rock climbing and mountain biking. Be sure to check out his motorcycle web comics, you’ll be giggling like school girl in no time. 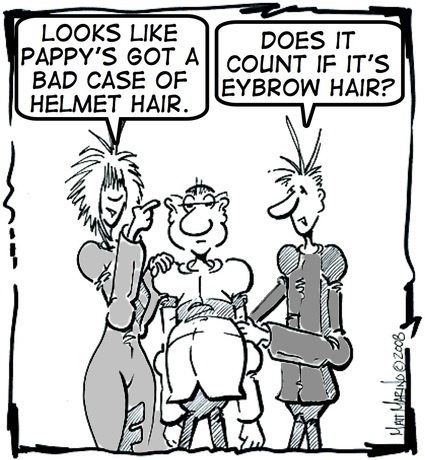 Matt made this comic especially for Helmet Hair Motorcycle Blog, and I’m trying to convince him to do some more. So hopefully we’ll see Matts stuff here on a regular basis. Thanks for the heads up on some good comic sources. I haven’t stumbled across many motorcycle comics. I love stumbling upon this websites comics, they are hilarious. Getting a motorcycle for sure soon, just waiting on age that’s all. As I search on motorcycles, I accidentally stumble on your blog. I got hooked into it since this one is on web-comics, perfect! I love reading web comics. I would surely, come here for new ones. Anyway, that is hilarious. Nice one! Keep it up! lung cancer can be prevented by avoiding cigarette smoking and polluted air`’. This is great! Was not aware that there were motorcycle related comics. It is true that motorcycle riders are a cross section of people with all kinds of talents. Looking forward to seeing more of these in the future. Helmet Hair – Motorcycle Blog	Powered by WordPress 73 queries. 0.649 seconds.